I try to use points and miles when I travel but sometimes I don’t. Sometimes I want to book a very specific hotel or I don’t want to waste my points if I can’t find a good redemption. In these cases, I use the quadruple stacking method. This method was first introduced to me by Jeremy at Go Curry Cracker. My husband and I spent a weekend hanging out on a houseboat with him and his family, Gwen from Fiery Millennials, and a bunch of other finance bloggers at FinCon this past September. Jeremy gave us this tip during FinCon but then later he wrote an awesome post about it. We recently tried out the quadruple stacking method on our honeymoon road trip through California and Oregon. Here are the steps we took and the results. 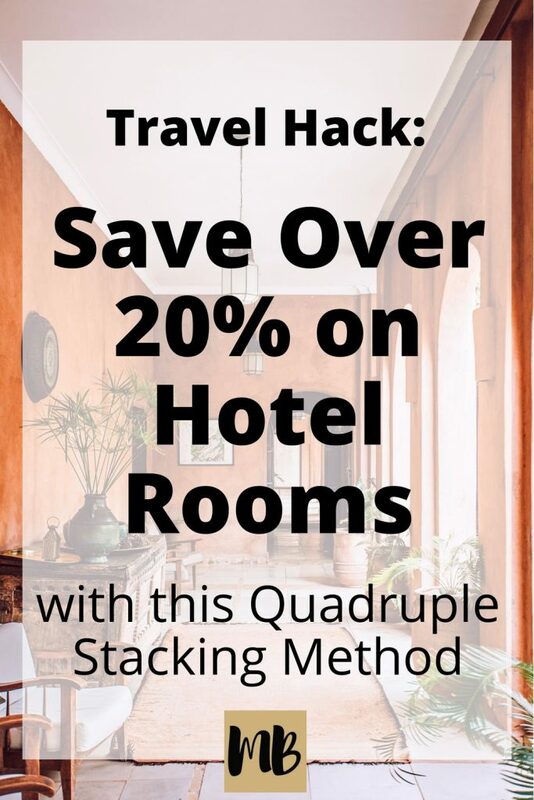 Spoiler alert – you can possibly save over 20% on your next hotel deal. In order to maximize the value of this method, you need a cash back account and a Hotels.com account. I’ve been using Ebates cash back for a few months now and I’m pretty happy with it. It’s free to sign up and the cash back you earn transfers quarterly to your bank account or PayPal. As you can see, I have $231 coming to me from Ebates in February. Not too shabby. I downloaded the Ebates browser tool so I can see when the website I am on offers cash back and I can activate it with one-click. I prefer the pop-up to having to remember to go to the Ebates website and click-through but it’s a personal preference. You get $10 for signing up for a new Ebates account through this link. A bunch of active promo codes! Gotta love this one. Now you’ve saved yourself some serious bucks. Niiice. 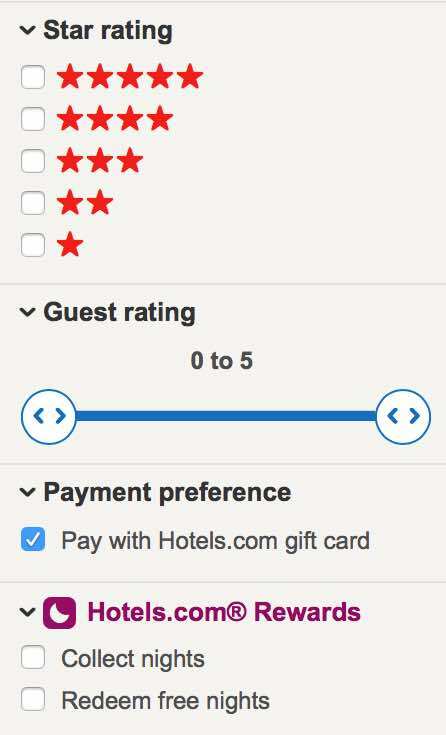 Once you’ve narrowed down the hotel on Hotels.com, make sure to select the filter that shows if the hotel can be booked with a hotels.com gift card. Don’t forget to check! It seems most hotels can be booked with gift cards but it’s worth confirming first. You can find out by checking the box for “pay with hotels.com gift card” on the left menu. So you’ve narrowed down the hotel, confirmed you can book it with a hotels.com gift card, and set yourself up with a cash back account. You are good to proceed to the first step, which is purchasing a Hotels.com gift card. I use Raise.com for gift cards and have found that Hotels.com gift cards are plentiful on this site. Lately, the Hotels.com gift cards have been hovering at around a 7% discount. That’s pretty good and if you sign up for Raise with this link, you can earn $5 off your first purchase in addition to the discount. Once you have a Raise account, you can activate your Ebates cash back account for an extra 1% cash back if you wish. As you can see in my Ebates screenshot above, I saved an extra 88 cents by activating Ebates on the Raise website. Nothing too crazy but it all adds up. Sometimes Raise has other promo codes you can stack on top of all of this other stuff too. I get Raise emails regularly and they often offer an extra 4-10% off purchases. It’s worth it to sign up. You have access to the gift card immediately after purchase. You can combine hotels.com gift cards on the hotels.com site so don’t worry too much about finding a gift card for the exact amount you need. Jeremy’s post shows how to combine hotels.com gift cards with screenshots if you need to figure it out. Next, you look for Hotels.com promo codes. Google “Hotels.com promo codes” or check out Retailmenot to find a list of codes to try. We used an 8% promo code when we booked our most recent trip. One thing you need to know about Retailmenot – it’s a referral site like Ebates so sometimes you can’t click a Retailmenot link AND use Ebates. I haven’t run into this issue with Hotels.com but I did run into it when I bought my grandmother flowers through ProFlowers for Christmas. Ebates was offering 24% cash back on ProFlowers and Retailmenot was offering a special discount on ProFlowers through their site. I tried to stack both discounts but it stripped out Ebates which was the better deal. Just a headsup. You can get up to 6% cash back on your Hotels.com booking with Ebates. The cash back registers after you complete your stay. One cool thing about Ebates is that it automatically applies coupons to your purchase. While it didn’t find any coupons for my hotels.com order, it has found extra coupons for me (up to 25% off) on other sites in the past. We’re a two person team so we went through these steps twice for maximum savings. We each have our own Ebates, Hotels.com, and Raise.com accounts. We used the savings for some fun on our honeymoon road-trip through California and Oregon. How do you save on hotel bookings? Any tips you’d like to share? 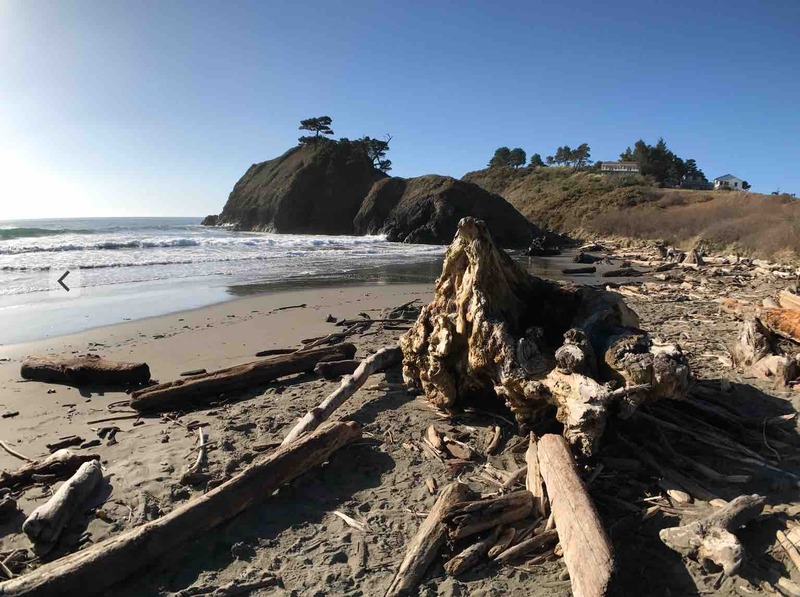 We did a tour of the Oregon coast a few years ago. It is a beautiful place, and you got some great pics. Congrats on making an honest man out of Doug! Thanks, Jeremy! We loved the Oregon Coast. Definitely going back. Hope 2017 is as amazing for you guys as 2016! Thanks for the heads up re: Raise with eBates. It looks like you can save some serious cash on chain restaurants in particular. I used to buy restaurant gift cards at the grocery store for the 5% cashback, it looks liek with Raise/Ebates you could easily get 20% off at a lot of places. Yeah it’s awesome! Patience is rewarded with Ebates. You can’t get access to the money immediately which makes it almost like a mini savings account. Unfortunately Ebates declined to credit the 10% on my computer, I’m guessing the vendor just refused to pay Ebates because my computer was in all likelihood a price mistake. So, because of that, Ebates offered me a “valued member” bonus offer of $20 to make any purchase within the next year. 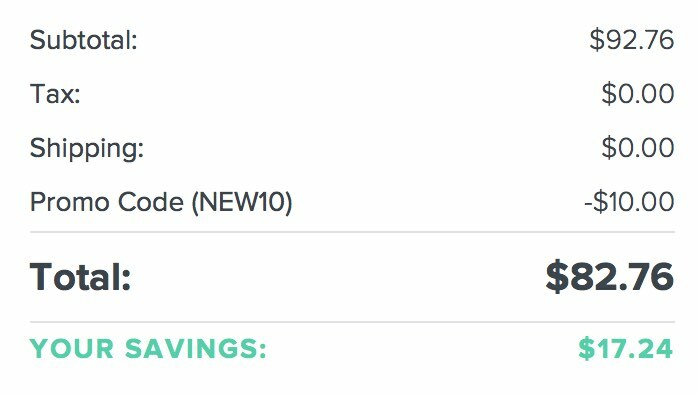 I also had the $10 offer for spending $25 on something from when I originally signed up…. – Signed up for Raise through you (thanks for that). -Used a different browser to go to Raise through Ebates for 1% Ebates cashback. -Got a $50 Dominos gift card for $44.92 less the $5 Raise credit to $39.92, and I’ll get $30 from Ebates…so I basically have a $50 gift card for just under $10. Dominos is not my favorite pizza by any means, but it is the closest and I already eat it occasionally. TJ recently posted…2016 Blog Traffic Round Up! Nice! $40 off is pretty great! I used to have an obsession with Dominos Lava Cakes in college and had to stop ordering Dominos! How have I not heard of raise?!? Totally signing up for this tonight. I’m all about hotels.com and Ebates already, so this is just icing on the cake 🙂 Ebates will sometimes check for promo codes too (like retailmenot)! Thanks for the great tip! Oh yeah! One more thing to stack with Ebates and Hotels.com to bring major savings!